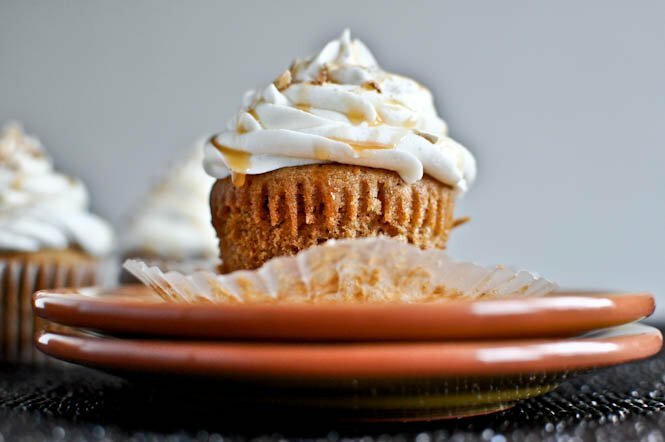 Sweet Potato Pie Cupcakes with Marshmallow Frosting. True story: I have never eaten sweet potato pie. I’ve never even seen a sweet potato pie. I’ve never been in the same room as a sweet potato pie. I’ve never tried to make my own sweet potato pie. I’ve never even looked at a recipe for sweet potato pie. The closest I’ve ever come to sweet potato pie is belting out James Taylor’s song (holy old school throwback vid) in my bathroom with the awesome echoing acoustics. Hairbrush = microphone, anyone?? But since I take pictures of my food and like to pretend that I know what I’m doing while giving all real chefs a bad name, I made sweet potato pie cupcakes. Annnnd I think I should be given a gold star for making a dessert with a vegetable. Progress! 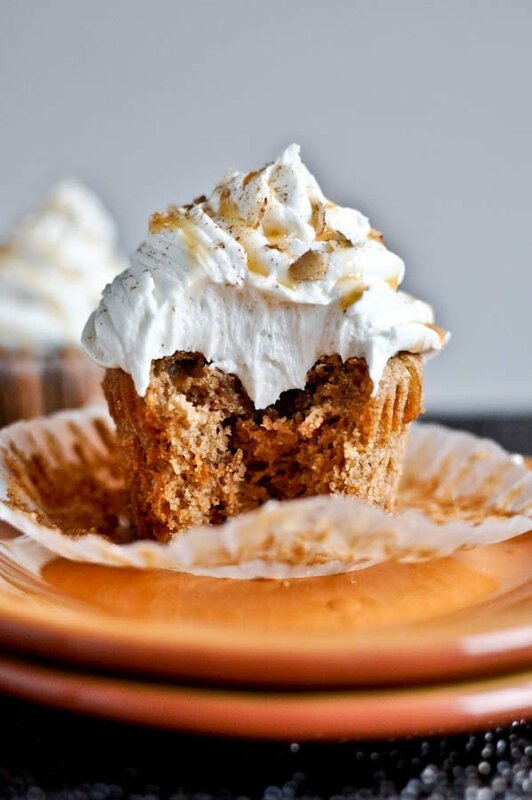 I’m really hoping one of you lovely fellows who have tasted sweet potato pie… or maybe those of you that are sweet potato pie connoisseurs… will make these cupcakes and tell me if I came anywhere close to sweet potato pie. I figure that sweet potato pie has sweet potatoes (duh), cinnamon, lots of sugar and then marshmallows? But I could totally be getting that screwed up with sweet potato casserole, in which case I just made a casserole cupcake. Which kind of sounds barfy. These are anything but barfy, but I’m whiny and needy today and need reassurance. Because… you know, eating a half dozen cupcakes in two days is not assuring enough. Help. Preheat oven to 350 degrees F. Line a cupcake tin with liners. In a small bowl, mix melted butter, sugar and graham cracker crumbs until moist, then press about 1/2-1 tablespoon of crumbs into the bottom of each liner. In a large bowl, whisk egg and sugar together until combined and no lumps remain. Add in vanilla extract and butter, then whisk in sweet potato. Add in flour, baking soda, salt, cinnamon and nutmeg, then add in milk and stir until combined and smooth. Drop about 1/4 cup of batter on top of each graham cracker crust. Bake for 15-17 minutes, or until cupcakes are set and spring back at the touch. Let cool completely before frosting. 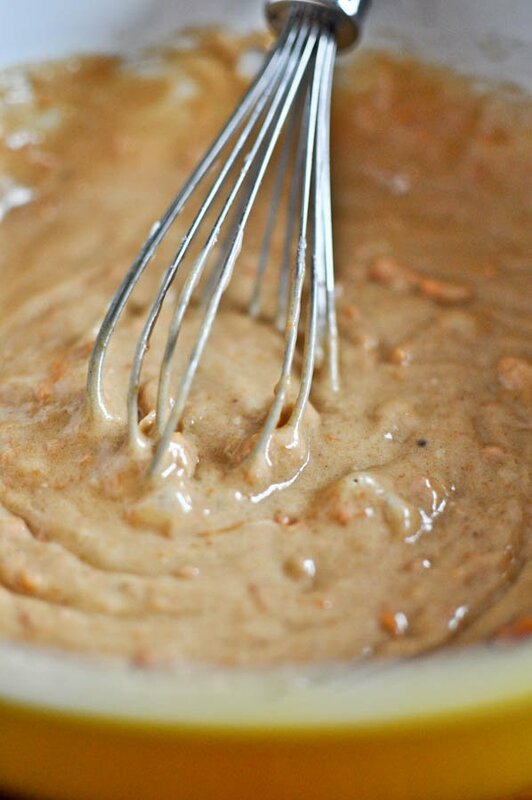 To make frosting: beat butter in the bowl of electric mixer until creamy. Add in fluff and beat for 2-3 minutes, then add in vanilla extract. With the mixer on low speed, add in powdered sugar 1 cup at a time until fully incorporated. Once all the sugar has been added, beat on medium-high speed for 2-3 minutes. If mixture if too runny, add a bit more sugar. If it’s too thick, add a bit of milk one teaspoon at a time. 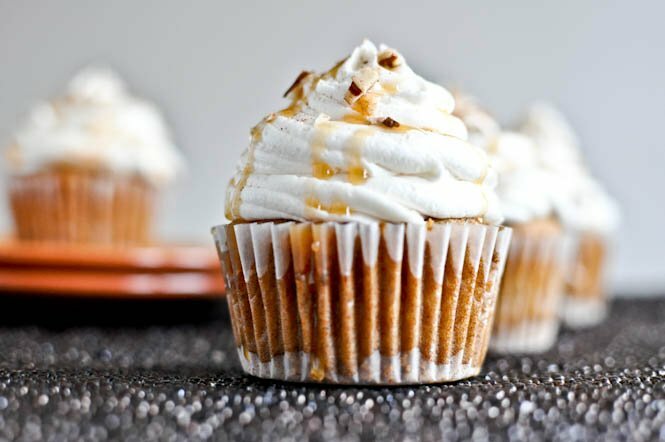 Frost cupcakes and drizzle with caramel sauce and crushed cinnamon pecans. I can’t wait to tell you about bread tomorrow. Caramelized Pear, Squash & Parmesan Noodles. 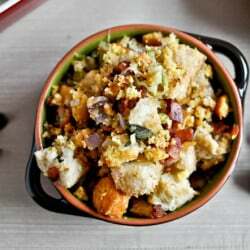 Double Bread Stuffing with Brown Butter, Bacon & Sage.